There are many lists on the web of psychiatric hospitals, former mental hospitals or lunatic asylums. This particular list differs in that it is arranged chronologically; it also acts as an index to the hospital files at Historic England’s Archives. It lists hospitals and/or asylums that cared for the mentally ill, concentrating on those that were purpose built, from Robert Hooke’s Bethlem Hospital of 1675 up to local authority institutions built in the 1940s – prior to the establishment of the National Health Service. The list was originally compiled from the files on these sites put together in the course of the RCHME’s survey of historic hospital conducted between 1990 and 1993. In 1993, after fieldwork had stopped, the six investigators who carried out the survey from three RCHME offices, at York, Cambridge and London, met up to exchange files so that we could each concentrate on a different hospital type. I took the asylums, and, in order to make sense of this deluge of information, I made brief notes on each site, with the approximate date of foundation, design and construction, later additions and alterations, what sort of information was in the file in terms of plans and/or photographs, and usually a snap judgment about its architectural interest. Below, more or less, are those notes. In addition is an NBR number – this is the file number, and should allow anyone to find the file at the archives of Historic England in Swindon. The results of the research were published in 1998 as English Hospitals 1660-1948, a survey of their architecture and design. The terminology used is contemporary with the date of construction, so there are institutions for lunatics, idiots, imbeciles and mental defectives. I did consider exchanging these terms for more socially acceptable wording, but took the decision to keep to the original as historically accurate. Opinions expressed are my own, and were sometimes formed at the end of a very long day. (I confess, I have changed the odd ‘very dull’ for plain or utilitarian.) As I review these sites, I may well find that those opinions also need reviewing. Fieldwork for the survey was carried out by the teams on a geographical division of the country. The York team covered the north, the Cambridge team the centre and south-west, while Colin Thom and I covered the south-east quarter from London, although towards the end of the project we also visited sites in the West Midlands, Staffordshire, and Avon. With my particular interest in asylums, I also visited The Retreat in York, and although Colin and I were not ‘doing’ Buckinghamshire, I grew up in Chalfont St Peter and so know the National Epileptic Centre there quite well. Often the information on the files covering the south-east is a bit thin, this is largely because I knew these sites and didn’t need to make such full notes, certainly not because they were less interesting. Apologies for errors, typos and spelling mistakes, the latter have not been assisted by the enthusiastic autocorrect facility. 1712 founded by Mary Chapman on account of mental instability within her family. Building listed Grade II*. Two wings added on south side c.1750. 1899 E. Boardman, new front range across north side of hospital. The hospital had closed by 1995. The west wing was later converted into housing. 1751, founded in a house in Windmill Hill, north of Moorfields, under the care of Dr Battie. 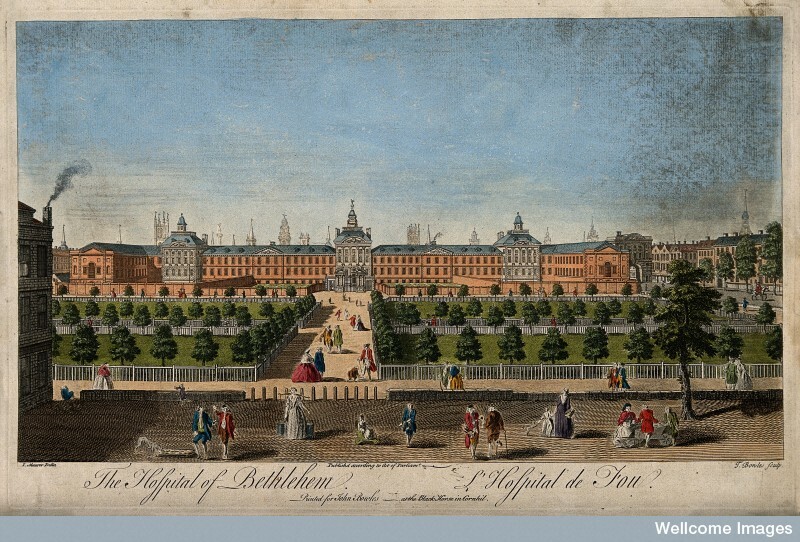 In 1753 pupils were admitted, and in 1754 incurable patients accepted. 1782-4, new building, George Dane the younger, architect, costing £40,000. Extended 1841, with ‘end infirmaries’, and a chapel built in 1842. In 1917-20 it was converted into the Bank of England Printing Works and demolished 1955-60.
c.1766 established as part of the Infirmary, 2 storey building situated at end of infirmary. 1767 established for the three counties of Northumberland, Durham and Newcastle-upon-Tyne. Superseded by St Nicholas’s Hospital in 1860s. 1824 leased to Dr Hall, remained in use until c.1855. Appears on early maps. Built 1772-6 to designs by John Carr, opened 1777 for 54 patients. 1813 fire destroyed northern block, replaced by new wing in 1817, with fire-proof floors. Detail from the 6-inch OS map, surveyed 1846-51. Reproduced by permission of the National Library of Scotland. By 1850 two further buildings added to the north-west, one wash house, brew house etc later the recreation hall, the other wards for refractory patients. 1865 chapel by Rawlins Gould, listed but derelict in the 1990s. 1886 first three buildings joined together and main staircase moved out of front block and new one built in new building immediately behind it. c.1890-1910 refitted internally, except committee room. 1890s onwards remodeling by Walter Brierly, including new recreation room 1906. Established in 1792 in the grounds of Liverpool Infirmary, on the site of St George’s Hall. It had accommodation for 60 to 70 patients. Three storeys, symmetrical, very plain building of fifteen bays. Decided to build a new infirmary and Asylum in Brownlow Street c.1806. Detail from the 6-inch OS map, surveyed 1845-9. Reproduced by permission of the National Library of Scotland. The new asylum opened in 1831, with 64 beds for patients from ‘a class above that which was ordinarily received into County Asylums’ but at reduced fee. It cost £20, 426 to build. Two storeys. Designed by Mr Foster, according to Kelly’s Directory. Closed c.1881 and adapted for use as University College Physics Lab. 1799 small asylum for 13 patients built near to Hereford General Infirmary by which it was administered. Demolished c.1870. First proposed in 1788 as part of the general hospital, the scheme got off the ground in 1810 when about £9,000 had been raised and the building opened in 1812. In appearance very like St Lukes, it was designed by Mr Ingelman of Southwell. Dr Storer, the Chairman and originator of the asylum wrote in 1809 to Dr Long Fox of Bristol concerning the use of iron as a building material and asked of its advantages aside from fire prevention. He also questioned the need for galleries, and asked for advice on the means of ventilation. Fox advocated the use of iron which would serve not only to alleviate dangers from fire, but also from lice and vermin. He was against galleries, as all that he had seen in London, York, Manchester and Liverpool were ‘cold and comfortless, subject to currents of cold air without the cheering influence of light and heat from the sun’. Detail from the 25-inch OS map, surveyed 1881. Reproduced by permission of the National Library of Scotland. In 1855 private patients were moved to the Coppice Hospital and Sneinton became the County and Borough of Nottingham Lunatic Asylum. From 1880 Sneinton was used for the county and the town used the new Mapperley Hospital. Sneinton was demolished and replaced by Saxondale Hospital in 1902. Built in 1811-14 to designs by Francis Stone. Norfolk Quarter Sessions resolved on 11 Oct 1808 to ‘consider the expediency and propriety of providing an asylum’. In 1810 a committee was appointed ‘to consider the best means of building, erecting and managing an asylum’ and the County Surveyor prepared plans for an asylum with 100 beds at a cost of £23,000. 1811 site purchased and work began early in the following year. Opened 29 May 1814. Plan from 1816 survives, in which year it was extended. Extended in 1849, 1850s (John Brown architect), who also designed an unusual octagonal chapel built there in 1856-9. Infectious diseases blocks added 1862 (Phipson, architect) Female ward blocks added in 1868 and 1873. 1880 new annex built on the north side of the road for 140 quiet cases. Designed by T. H. B. Heslop, the County Surveyor. Two storeys. 1900 alts and adds by A. J. Wood. It then became an annex for male patients with females at the old site. Became a war hospital in the First World War. 1920 an isolation hospital built. 1810 new site acquired. 1812-15 new asylum built for 200 patients, James Lewis architect, two wings for criminal lunatics. Enlarged by P. C. Hardwick. 1838 wings added by Sydney Smirke. Further adds and alts 1848. 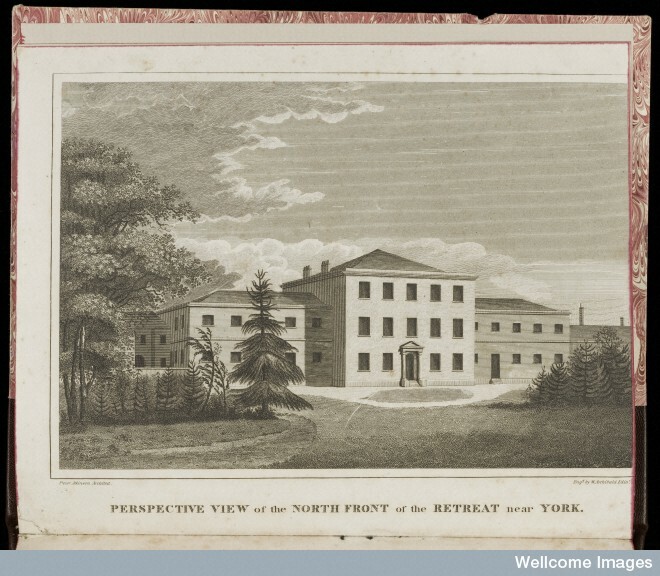 1809 resolved to erect an asylum, plans were drawn up in 1812 by Thomas Standen of Lancaster. Opened 28 July 1816. Later had a bad reputation as pro restraint. Paul Slade Knight, Medical Officer. 1844 Select Committee Report, back-to-back cells, small airing courts. One of first (with Barming Heath) to have detached infirmary. 1845 two new wings to north and east. In 1854 a second county asylum was built at Rainhill. 1879-83 annex built to north. Detail from the 6-inch OS map, surveyed 1891. Reproduced by permission of the National Library of Scotland. 1907-38 hospital block and several villas: Cassidy House (1907), Campbell House (1909), De Vitre House (1912), Ladies Villa (1916), Gaskell House (1938). Good history written in 1948. Closure was mooted in 1991. 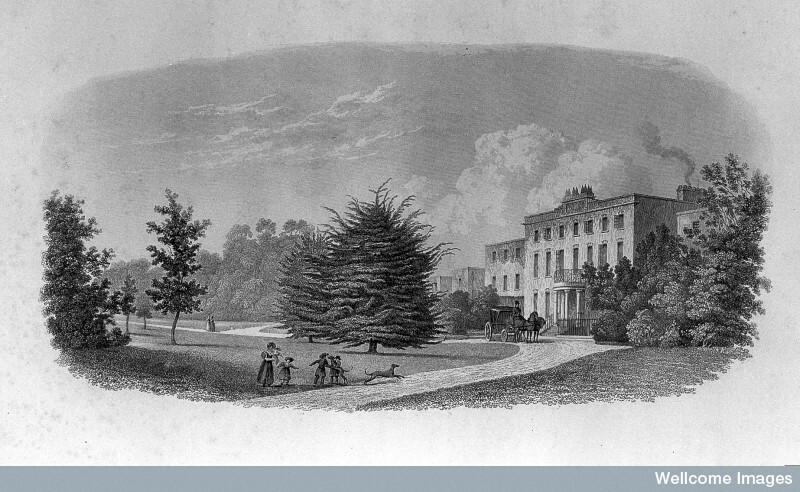 Private Asylum, 1813 opened by Dr Charles Finch for 75 first class patients in Fisherton House. Formerly seems to have belonged to Charles’s father, Dr William Finch. Throughout the 19th century run by family. In 1779 had purchased nearby asylum, Laverstock House, also had two in London, Kensington House, the and The Retreat, King’s Road. Originally just house and converted outbuildings. New ward for criminal lunatics 1850.
c.1858-61 adds to criminal and pauper wards and chapel and recreation rooms. Detail from the 25-inch OS map, surveyed 1879. Reproduced by permission of the National Library of Scotland. c.1923-1936 U-shaped ward block added to south of ballroom. Nice description of a visit to the asylum in 1850 by ‘a London Reporter’ in file. A fund was started for the asylum in 1794. In 1812 the County and City of Gloucester and subscribers formed a union to provide an asylum. Designs were provided by William Stark in 1813 (the year he died), work was carried through by another architect. Not completed until 1823. For 120 patients, 24 opulent, 36 charity and 60 paupers. 1856, part of the building was raised a storey. At this date subscribers bought out by City and County and it became an asylum for 400 paupers. Detail from the 25-inch OS map, surveyed 1883. Reproduced by permission of the National Library of Scotland. Cornwall Lunatic Asylum, designed on a radial plan by John Foulston c.1816. Foundation stone laid 1817 and asylum opened in 1820. Six ward wings. Classification by social class and degree of insanity: pauper, subscription, superior; noisy and/or violent, wet, incurable, ordinary, convalescent. Detail from the 6-inch OS map, surveyed 1881. Reproduced by permission of the National Library of Scotland. 1901-6 large annex, échelon plan, also by Silvanus Trevail, Foster Building. Begun in 1816, opened 1818. Pauper Lunatic Asylum for the West Riding. Watson and Pritchett of York architects. Advised by Samuel Tuke, of the York Retreat. Its H-shaped plan is that recommended to the 1815 Select Committee on Madhouses by James Bevans. Opened in 1818. A detached block added in 1876 and further additions 1880. Detail from the 25-inch OS map, surveyed 1900. Reproduced by permission of the National Library of Scotland. VCH: around the end of the 18th century money was left to build a ward for the insane at the infirmary instead the county justices and trustees of the infirmary with help of subscribers opened the Staffordshire General Lunatic Asylum, north-east of the town centre in 1818 for patients of all social classes. It was designed by Joseph Potter, the County Surveyor. Enlarged 1849-50 and several times after. Renamed St George’s Hospital in the late 1940s,. Became asylum entirely for paupers after Coton Hill opened in 1854. Corridor plan. Opened in 1820 as Lincoln Lunatic Asylum, a subscription hospital. Designed by Richard Ingleman c.1818. Three ‘ranks’ of patients according to their means. First asylum to completely abandon mechanical restraint in 1837 – Robert Gardiner Hill then resident medical officer. 1894 adds and alts William Sconer, new admin including dining and recreation room on first floor and new dormitories in patients’ wings. Oxford or Radcliff Asylum. In 1812 the governors of the Radcliffe Infirmary set up a committee to investigate the practicality of erecting a lunatic asylum near Oxford. Progress was slow. First part of site acquired 1819, increased in 1821 when plans must have been finalized as tenders were advertised in May that year. Designed by Richard Ingleman of Southwell who had surveyed the original site contemplated in 1813. Foundation stone laid August 1821 and completed 1824. By 1832 two single-storey ranges with four rooms each had been added behind the kitchen. 1852 two wings to north, J.C. Buckler for noisy and violent patients. 1877 offices, recreation room over, wing for 23 females. Wilkinson to south of kitchen ‘virtually a second asylum block’ corresponding male wing begun 1887. Cheshire County Asylum Built 1827-9 to designs by Willliam Cole junior for 90 patients U-plan building, wings added 1849 and 1870s. Extract from the6-inch OS map surveyed in 1869. Reproduced by permission of the National Library of Scotland. Cheshire Lunatic Asylum, Cheshire. Line engraving by Dean after Musgrove. Suffolk County Asylum Established in 1827-9 by Suffolk County in the converted House of Industry built c.1767 and closed in 1826. It was enlarged and altered before opening in 1829. 1899 plans for further extension, begun 1901, included pretty isolation hospital, farm buildings stores, bakehouse, boiler house, butchers shop, attractive house for the medical superintendent, lodges and staff houses. 1926 nurses’ home, Brown and Burgess. Opened in 1831. Corridor plan. One of the first large-scale asylums, built after the 1808 County Asylums Act (38 Geo III, c.96). By 1823 only nine county asylums had been established. 1827 Visiting Justices Committee appointed to erect asylum. Advertised for land and a competition announced for a plan of an asylum for 450 inmates with extension for additional 150. Separate wards, for different classes, noisy at end of building. Windows secure but provide view. Not more than three storeys. 1828 William Alderson’s plans selected in competition. He was a Quaker. Plan very like Wakefield, Glasgow etc with octagon and central stair and wings off it. Finally erected for just 300, within six months full. Cubitt asked to adapt the building for additional 200. 1897 Nurses’ home and servants accomm. First Kent County Lunatic Asylum 1829 designs by John Whichcord, opened 1 January 1833 (St Andrew’s House). Corridor plan. Original building converted to housing, remainder largely demolished. 1836, 1842, 1844, 1847 adds. 1871 Hospital block, as Martin Bulmer. Another venture of Dr Fox’s, again converted houses? 1832. Listed. More fireproof construction, Fox Barrett system. 1859 committee of visitors inviting architects to compete for enlargements but it was found unsuitable for further expansion and a new site was acquired for a second asylum. The Justices proposed selling the old building when the new asylum opened (Herrison, built 1864), but this idea was opposed and it remained in use until 1895. Extract from the 6-inch OS map, surveyed in 1887. Reproduced by permission of the National Library of Scotland. Near Plympton, handsome early eighteenth century country house bought in 1835 by Dr Charles Aldridge for use as a private lunatic asylum. Censured in the 1844 Report of the Commissioners in Lunacy for using excessive degree of restraint. In 1844 it had 17 private and 66 pauper patients, the latter in outbuilding. “We have observed that houses which have been formerly private mansions frequently require extensive alterations to make them fit for asylums; that the mansion is sometimes engrossed by the proprietor, his family, and a few private patients; and that the paupers are consigned to buildings which were formerly used as offices, and outhouses”. Extract from the 6-inch OS map surveyed in 1856. Reproduced by permission of the National Library of Scotland. In 1934 Plympton House was acquired by Augustinian Care, a branch of the Sisters of St Augustine of the Mercy of Jesus, and became St Peter’s Convent, or Care Home for elderly and mentally ill patients. Staffed by nuns of the order. The home closed in 2014. Northampton General Lunatic Asylum Established for both paupers and private patients. 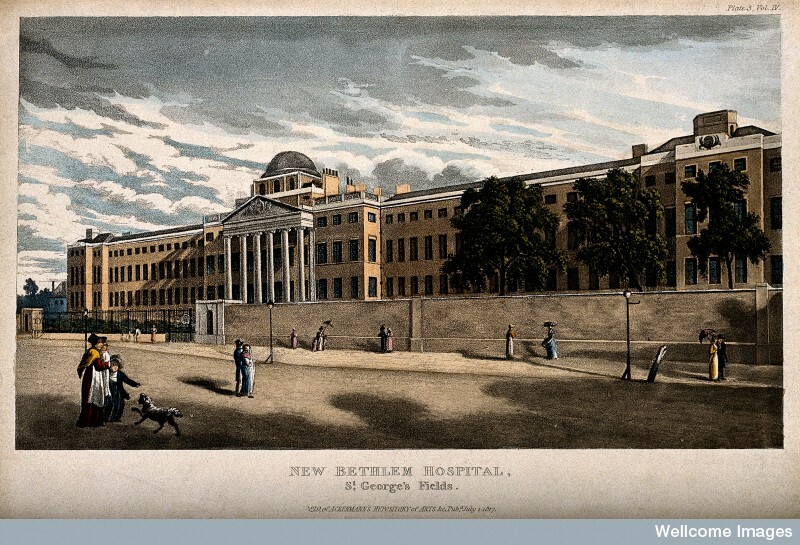 In 1804 the General Infirmary received a bequest to make provision for ‘persons of disordered mind’. Further gift of 100 guineas offered in 1806 but no action. 1814 sub committee to look after asylum fund. Eventually, in 1833, Governors decided to build asylum. 1834 site purchased. 1835 competition for design: 70 patients, 50 paupers and 20 private. Won by Mr Wallett, seems to have been an apothecary at Bethlem Hospital. Foundation stone laid 1836, opened 1838. 1874-6 paupers removed to new County Asylum at Berry Wood, workshops converted to luxury apartments for wealthier patients. Extract from the 6-inch OS map revised 1899. Reproduced by permission of the National Library of Scotland. Extract from the 25-inch OS map, revised in 1902. Reproduced by permission of the National Library of Scotland. By 1915 OS appears as disused, but was still in operation 1903. In existence by 1837 when it was licensed to receive 35 males and female lunatic patients, 20 of whom must be lunatic paupers. Plan 1839 by M. Millar in Herefordshire Record Office. Erected as a private asylum c.1838 in Asylum Lane, later Argyle Street. It was taken over in 1849 as the borough asylum by the Corporation of Hull. Extract from the 6-inch OS map surveyed in 1853. Reproduced by permission of the National Library of Scotland. Built 1839-41 designed by William Moseley. Corridor plan. Extract from the first edition 25-inch OS map surveyed in 1868. Reproduced by permission of the National Library of Scotland. Extract from the 1:1,250 OS map surveyed in 1948. Reproduced by permission of the National Library of Scotland. Opened in 1845 it was designed c.1842 by Charles Fowler, architect of Covent Garden market 1828-30. Listed grade II*. Extract from the 25-inch OS map surveyed 1888. Reproduced by permission of the National Library of Scotland. According to Kelly’s Directory it opened in 1845. Already taking tenders for additional buildings in 1846. The building is dated 1843. A block plan of 1903 by A. J. Davis from County Record Office. By 1891 had 800 patients. New wings added, designed by Thomas Groves, wing at each side, laundry, dining hall , workshops, mortuary , chapel and two lodges. Extract from the 2nd-edition OS map surveyed in 1885. Reproduced by permission of the National Library of Scotland. Oxford County and City Pauper Lunatic Asylum Designed in 1844 by R. N. Clark of Nottingham, opened 1846. Extract from the second-edition OS map revised in 1897. Reproduced by permission of the National Library of Scotland. Towards end of First World War became a Military Hospital, then in 1920 Ministry of Pensions. Similar plan to Wakefield etc with octagonal pivots. Extract from the second-edition OS map revised in 1937. Reproduced by permission of the National Library of Scotland. Dated 1845, the year they decided to build, opened 1847. Designed by Scott & Moffatt, Elizabethan style. For 144 patients. Extract from the 6-inch OS map surveyed 1846-51. Reproduced by permission of the National Library of Scotland. 1851 two wings added extra 100 patients. Fire destroyed laundry. Extract from the 6-inch OS map revised in 1950. Reproduced by permission of the National Library of Scotland. Second Manchester Royal Lunatic Asylum Site purchased 1845 at Cheadle. Competition held for plans, won by Richard Lane, for private patients but remarkably plain. Complicated classification according to wealth and fees paid. Extract from the 6-inch OS map revised in 1897. Reproduced by permission of the National Library of Scotland. Decided to build 1846 for 300 patients. Obtained plans from the architects of Jamaica, Derby County and Birmingham Borough Asylums. Chose Jamaica, Mr Harris. Opened 1852. Extract from the 6-inch OS map revised in 1903. Reproduced by permission of the National Library of Scotland. West Derby Lunatic Asylum Designed in 1846 by Harvey Lonsdale Elmes, who died in 1847. William Mosley seems to have taken over as architect to the asylum. Built 1847-51. Alternative Italianate and Elizabethan designs produced. Separate block plan. Classified patients into convalescent, noisy, and idiot and epileptic patients each in rectangular blocks with a water tower. 1859-60 ext new wings on M & F sides. Changed main front to north with new entrance block. New rec hall. 1878 annex similar to Digby Hospital, Exeter – Avon Division. Designed by G. E. Grayson 1,000 patients. Enlarged 1898 add. 200 beds. 1904 two Y-plan wards added. 1912 ext. Extract from the 6-inch OS map revised 1906. Reproduced by permission of the National Library of Scotland. 1937 new Rec Hall ‘Reeve Recreation hall’ Richard Owens and Son. Old one converted to kitchens. 1938 Admissions Hospital taken over as naval hospital until 1949. Now Benedict Clinic. Extract from the 1:25,000 OS map published in 1953. Reproduced by permission of the National Library of Scotland. Extract from the 6-inch OS map revised 1906-7. Reproduced by permission of the National Library of Scotland. Extract from the 25-inch OS map revised 1902-3. Reproduced by permission of the National Library of Scotland. 1848 designed by Thomas Fulljames, fo Gloucester and built in 1849-52 to the north of Abergavenny. The union of these counties was dissolved in 1868. County and City of Worcester Lunatic Asylum 1847 City and County agreed to combine to build an asylum for 200 patients. Site, White Chimneys Farm, bought same year and competition held for design. Won by Hamilotn & Medland, of Gloucester, 1848. Work began 1850, opened 1852. Similar to Maidstone. 1861 new recreation room designed by Henry Rowe, and Wyvern House, 100 female patients. The men’s airing court, contained within the ranges on the men’s side, is shown with a central mound on 1926 OS map. In 1866 a skittle alley was made in this court and the Commissioners in Lunacy recommended that a rustic seat or sun shade should be made on the mound. Court now level. 1883 annex designed for epileptics and suicidal 70 males, 140 females, 3 blocks (quite interesting pavilion plan) ‘idiots, imbeciles, chronic demented epileptics’. Extract from the 25-inch OS map revised 1902. Reproduced by permission of the National Library of Scotland. By the 1840s the need was apparent for a second asylum for Middlesex. Designed for 1,250 patients, it was the largest in Eurpoe. A Competition was held for the design. S.W. Dawkes, architect, was appointed in 1848 (Dawkes was a pupil of Pritchett, as in Watson & Pritchett, York) Under the terms of the competition, the asylum was to be for 1,000 patients, a third of them to be in single rooms the rest in four to five bedded dormitories. This on Conolly’s recommendations. Also fireproof construction. There was a debate at the time as to whether it should be two or three storeys (reported in The Westminster Review and The Builder). 1858 legal action against Dawkes re construction. Unsuccessful. Essex County Asylum Competition for the design won by H E Kendall junior in 1849. Builder George Myers. 400-450 beds. Completed July 1853. Cost £65,025 foundation stone dated 11 Oct 1851. Now converted into housing, some parts demolished. Wiltshire County Pauper Lunatic Asylum Designed by T. H. Wyatt erected 1849-51 compare with Lincoln – semi-circular bits. Derbyshire County Lunatic Asylum 1849-51, designed by Henry Duesbury. This is one which had its (typical corridor) plan much reproduced including by Sibbald in Scotland. Held to be something of a model asylum at this time. Pastures Hospital closed in 1994. First Lincolnshire County Asylum. Soon after the 1845 County Lunatic Asylums Act a committee of visitors was appointed to establish an asylum. Site acquired two miles south of the city. Competition for design c.1849. J. K. Hamilton & Medland won with Italianate design, corridor plan, builder George Myers. The hospital remained empty for many years after closure in about 1990. Conversion to housing began around 2014 by developers Mabec, working with Lincolnshire estate agents Piggot & Crone. Established for the feeble minded, idiots and imbeciles of Essex, Suffolk, Norfolk and Cambridgeshire. Originally the Railway Hotel, built in 1840. 1852-9 it was a branch of Earlswood Asylum and in 1859 became the Eastern Counties Asylum (Kelly’s Directory). But seems to have been in use as an asylum for idiots since Christmas 1849. The hotel was built by Lewis Cubitt for Sir Morton Peto, called the Victoria Hotel. Competition from established hotels quickly ruined it. In 1848 Dr Andrew Reid established an Idiot Asylum at a house in Highgate and Peto offered the hotel to him until Earlswood should be completed. Building commenced on the Bucks County Asylum in 1850 to the designs of David Brandon (perhaps with T. H. Wyatt) and opened in 1852. It provided accommodation for 200 patients. Good plans and perspective of original building. The hospital closed in 1991, all but the chapel and some staff houses were demolished and a new housing development built on the site. Hampshire County Lunatic Asylum Built 1850-2 to designs by J. Harris of Hanwell on a corridor plan. An asylum had been established in 1830 in St Peter’s Street, then moved to Lauriston House. The hospital closed in 1996, it was subsequently redeveloped for housing. Foundation stone laid by Prince Albert in 1852. Designed by W. B. Moffatt (check designs also by Robert Kerr and George Morgan?). First asylum in British Isles built to cater specifically for those with mental disabilities. 400 inmates. Established by Revd Dr Andrew Reid. Charitable foundation paid for by London Livery Companies. Royal Earlswood Hospital closed in 1997, main buildings converted into apartments with new blocks of flats and a housing development built on site, the development was named Royal Earlswood Park. In the main building renamed Victoria Court, the former entertainment hall has been converted into a swimming-pool and gym for the use of residents. The workshop block has been named Edward House and the infirmary Helena House. Opened 1854 (VCH), designed by Fulljames and Waller of Gloucester in Gothic style for middle and upper class patients. Extended by 1880. Closed 1975 and demolished 1976 to make way for the new general hospital. Durham County Lunatic Asylum Although first proposed building an asylum in 1827 no action taken until 1855. Purchased site and asked County Architect, John Howison, to prepare plans. Built 1857-9. The hospital closed in 1991 and all the hospital buildings demolished some years later. Cambridgeshire Asylum Designed in 1855 by George Fowler-Jones. Originally plans were drawn up by H. E. Kendall, as winning design in competition 1850, but were abandoned as too expensive. Fowler-Jones was aided by Samuel Hill, the Medical Superintendent of the West Riding Asylum (I think). Begun 1856, opened 1858. Plans in Ann Report of Commissioners in Lunaccy 1861. The hospital closed in 1999. Following closure the site was sold for redevelopment, much of the hospital complex was demolished, but some parts were converted to housing, including the 1905 ranges added to the south. Decided to build new asylum 1853. Site purchased 1856. George Fowler Jones of York appointed architect, he had recently designed Cambridgeshire Asylum, Fulbourn. Work began 1857, opened 1860. 1935-38 Parrott and Dunham, large expansion, nurses’ home, admission hospital (interesting one, south of main site), two detached villas , medical superintendent’s house. Listed. Ground and first floor plans from 1861 Annual Report in file. The hospital closed in 1999, and has since been converted to housing with a large housing development to the south. Massive long description of it in Journal of Mental Science April 1860. Opened 25 July 1859, designed by H. E. Kendall. Includes small plan. Polychrome brickwork. Plans approved 1856 (competition won) by Commissioners in Lunacy, work began June 1857, designed strictly in accordance with the rules of the Commissioners. Three storeys high. The hospital closed in 1995 and the buildings were converted into apartments, renamed Southdowns Park. T. C. Hine (George’s pa) 1857-9 registered hospital to attract private patients. Designed for 100 patients of the upper and middle classes. It closed in 1986 and was converted into apartments, known as Hine Hall. Established in 1858 in a converted house which was adapted by Fulljames and Waller. House early 19thC villa. For paying patients previously at county asylum (Horton Road Hospital). Wings were added to either side of house and a winter garden erected in garden grounds. Opened 1860. 1896-7 rebuilt original house to include medical superintendent’s residence. Second Dorset County Asylum 1860-3 designed by H. E. Kendall. Competition held in 1859, plans approved 1860, building opened 1863. 1912 three-storey wing added to north of corridor in middle of Hine’s wing of 1890s, for convalescent patients. Good Y-plan Nurses’ home, by George Oatley and partner (demolished). Two-storey centre, Ruskinian number – rendered wings three storeys. Herrison House nice. The hospital closed in the early 1990s and the site developed for housing – retaining and converting the principal earlier ranges – named Charlton Down. ‘typical corridor-plan hospital of the 1860s’ [Elaine Harwood] Description from Annual Report of Commissioners in Lunacy for 1861 (PP.1862 XXII) Attractive example. City of London Asylum, Built 1862 to designs by J. B. Bunning. Listed in 1992.
plan interesting version of corridor with broader corridors, large day rooms and dormitories and fewer single rooms, much more broken up than earlier asylums. Built 1862-7 to designs by C. H. Howell, County Surveyor. 1876 laundry and chapel doubled in size, and new workshops, cottage hospital for 16 patients, ward for 100 males and block for 300 females. Built as the State Criminal Asylum, 1863, to designs by Major-General Joshua jebb architect of the Model Prison at Pentonville. Three storey and basement, polychrome brick, small round-arched windows. Built 1865-9 as the asylum for the county borough of Newcastle. William Lambie Moffatt. Foundation stone laid August 1866. Cost £65,000, about 200-250 beds. Stone, two storey, large dining hall/recreation hall with chapel over (gutted by fire 1986) with seating. Recreation hall with Royal Doulton tiles ornamenting proscenium arch. Accommodation comprises large dormitory on one side of gallery and singe rooms on other. Was threatened with closure and partial demolition. 1892-1900 ext John W Dyson competition judged by Hine. The present buildings, which accom over 400 patients, will be adapted for female patients and the extension devoted entirely for male patients. BN ill and plan (échelon). 1916 last of recent extensions completed, two villas for 40 patients each, nurses’ home, isolation hospital with six beds. Wonford House was built 1865-9 to replace St Thomas’s Lunatic Asylum for private patients. For 120 patients, designed by W. F. Cross. Good solid stone building, reminds me almost of Pilkington’s RSNH at Larbert. 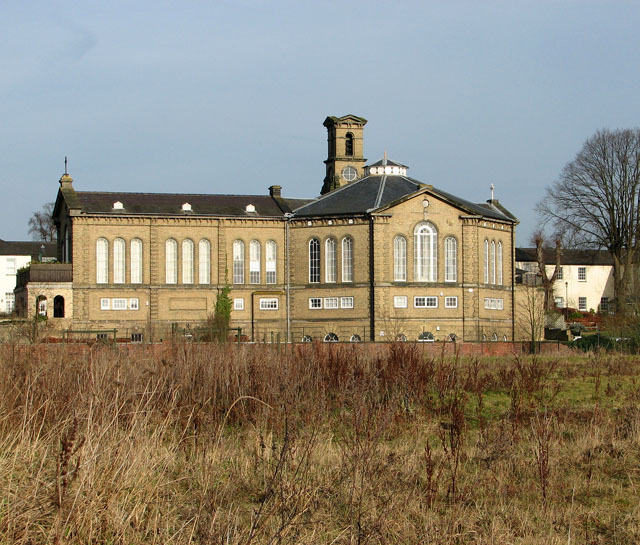 Only additions were Recreation Hall and theatre, and chapel. 1934-6 Admission Hospital W. H. Town, very nice with lots of verandas, single storey. This appears to have been demolished, but the older buildings remaining. A Y-plan ?nurses’ home also survives, but there is much new development on the large site. Still in hospital use 2015. Original Leicestershire asylum seems to have opened in May 1837, part of university buildings. 1867 tenders accepted for new asylum designed by E. L. Stephens, borough surveyor, opened 1869. Originally contained 274 beds in each division on ground and first floor. Two wards (front and back) second floor associated dormitories, 24 single rooms, 2 padded, 2 strong rooms. Cost incl site and equip £48,858. Attractive building, multi-gabled façade end bays with ships hull/ogee-shaped gables. Established in 1868 by Dr John Haydon Langdon-Down as a private sanatorium for mentally afflicted children of aristocratic or wealthy parentage. Down’s Syndrome was named after him, he was a pioneer in the study and classification of mental illness. In 1858-68 he was Medical Superintendant at Earlswood. In 1868 he purchased an unfinished house near the Thames at Hampton Wick. It was completed by Rowland Plumbe. 1910-11 isolation hospital added with 6 beds. 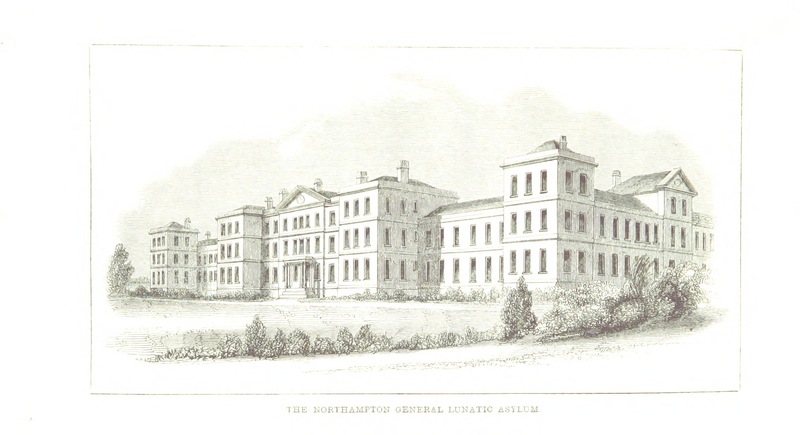 Berkshire, Reading and Newbury Asylum Begun in 1868 to designs by C. H. Howell and opened in 1870. 1878 enlarged, again by Howell, new wings for 500 patients to north-east and north-west, recreation hall in front of the south block, enlarged chapel, dining hall, farm and laundry. Interesting example of later development of corridor plan. Handsome entrance block to original buildings. Ipswich Borough Lunatic Asylum Built in 1868 to designs by Mr Ribbans. Corridor plan with bay windows in corridors and dayrooms with canted bay ends and some dormitories. East Riding Lunatic Asylum Built 1868-71, C. H. Howell to replace asylum at Clifton which it shared with North Riding. Agreed to erect independent asylum in 1865. Italianate style. 300 patients. Very similar to Fairmile Hospital, Cholsey. Hospital history of 1991, curious illustrations. 1868 designed by John Giles, of Giles & Biven, for the Metropolitan Asylums Board as one of two asylums for pauper imbeciles. Pavilion plan, 1,500 beds. 1913 escape bridges, though these had been proposed back in 1902. 1926 Coles Farm acquired and new boiler house completed, and new Nurses’ Home. Leavesden’s twin, built 1869-70 to designs by John Giles & Biven for the Metropolitan Asylums Board at a cost of about £85,000. Somewhat bleak. 1873 extensions by Giles & Gough, a recreation hall with a stage and a block for 160 females. 1878 two additional ward blocks completed. 1914 Admissions block, plans delayed? Fourth Lancashire County Asylum, Interesting for its transitional plan between pavilion and échelon, like Cane Hill, U-plan. Situated to the north of Preston. Site purchased and building commenced 1869, official opening 1873, though partly occupied since June 1872. 1909 planned new annex, competition for design awarded January, opened 1914 Sykes and Evans architects 790 beds. Plans reproduced in Hine’s RIBAJ article. Founded 1866, appeal for funds 1868, competition for plans 1869 won by Messrs Mathew & Quilter of London. 1872 first portion erected with 50 beds, two storeys. Plan Warwickshire RO. Northamptonshire County Asylum (Berrwood asylum) Site chosen 1871, built 1873-6, to designs by Robert Griffiths of Stafford. Quite severe in appearance. 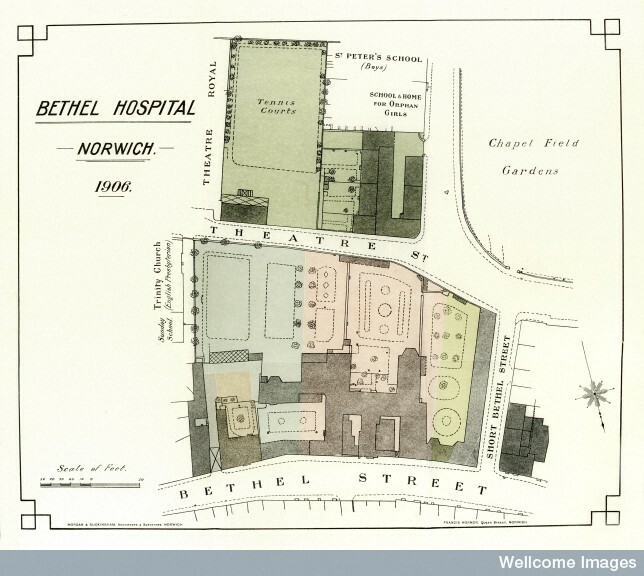 1882 plans for extension, 150 patients, including epileptics and sick, completed 1884. Extract from the 6-inch OS map revised in 1899. Reproduced by permission of the National Library of Scotland. Historic England Archives, BF101601 see post Holloway Sanatorium – garish or gorgeous? Founded by Thomas Holloway, for the ‘unsuccessful of the middle classes’. Designed by W. H. Crossland, who won a competition for the design 1871-2. Patients admitted 1884, official opening 15 June 1885. ‘all exuberance of ornament and expensive detail is avoided’ was the claim, but the building itself rather belies that statement. Could knock the spots off a Flemish Renaissance Cloth Hall. ‘The central grand entrance and staircase is only used for visitors on state occasions’. Departed from the standard ‘gallery system’ because it ‘does not conduce the comfort or general management of the building’. All day-rooms, dormitories and single rooms have a south and south-western aspect. 100 patients initially. Classification of inmates: male side four classes, 1st, 2nd, sick and feeble and excited. A quarter of patients occupying single rooms. Feeble patients all on ground and first floors. Provision for fever and infectious diseases on upper floor with separate stairs, for nurses. Attendants between day-rooms and dormitories with a glass window or doors of communication to overlook patients. Novel rules: no patient allowed to be an inmate for longer than 12 months. No hopeless cases. No re-admission after discharge. Middle classes only. Historic England Archives, BF101176, mostly demolished, just the central admin block and the chapel appear to have been retained, with a large housing development on the remainder of the site. Kent County Asylum Built in 1872-5 to designs by John Giles and Gough, originally for 870 patients. Pavilion plan, rather like a horizontal version of the MAB asylums at Caterham and Leavesden. Five villas were added to the south of the main complex, firt two 1896, 100 beds each, probably W. J. Jennings of Canterbury. 1938 new admissions hospital and convalescent villas, designed by W. H. Robinson, Maidstone. 1864 founded for idiot children of poorer classes, new building Gothic stone 80 children. Established by the Metropolitan Asylums Board for imbecile children. Designed by A & C Harston 1875, completed 1878 in which year a second complex to the west was commenced, completed in 1880. Two infirmaries added 1881 and recreation hall 1883. Portsmouth Borough Lunatic Asylum Designed by George Rake of Portsmouth, built 1875-9, pavilion plan, Byzantine-Gothic style. Good example of its type. 1934 voluntary patients’ unit completed for 24 patients. 1880 ‘about to erect’ 616 patients, opened 1882, to serve borough and district. Designed by Martin & Chamberlain, Gothic style, interesting variation on the pavilion or separate block plan. Compare with Durham County Asylum. City of Exeter Lunatic Asylum, 1881 Exeter Corporation held competition for design of asylum which was won in the following year by R. Stark Wilkinson of Exeter. Plans approved by Commissioners in Lunacy in 1883. Opened 1886. A nice example of its type, not échelon but still aiming to find solution to problem of separating patients from service corridors and offices. Third Surrey County Asylum Opened in 1883, it was designed by C. H. Howell, County Surveyor, and transferred to the London County Council after the Local Government Act of 1888. Hine thought it was Howell’s most important work. Originally designed for 1,100-1,200 patients but later extended for 2,000. Proto-échelon plan. Chapel oddly placed behind the admin block. Plan reproduced in Hine’s RIBAJ article. Derby Borough Asylum Proposed in 1846, site considered 1863, more sites considered and one acquired in 1874. Competition held for the design in 1884, won by B. S. Jacobs of Hull, and opened in 1888. 1936 admissions hospital, Kingsway House, opened 1938. National Society of Epilepsy. Established by the National Society for the Employment of Epileptics in 1884. It was founded at Skippings Farm and the first building erected was a temporary iron structure since demolished for 20 male patients. Tubbs and Roberts farms were purchased later. First permanent villa begun 1894, designed by Young & Hall, Susan Edwards House (now demolished) for male patients. Largest dormitories 9 beds, all upstairs. 1896-8, four villas built , including in 1897 home for women, paid for by Passmore Edwards (Eleanor House) designed by E. C. Shearman (on the right near entrance). Male home built same year (? Greene House), designed by Maurice B. Adams, with dormitories on ground floor, largely singe storey with staff accommodation only in small upper floor. 1927 Recreation hall/Chapel extended 1959. 1885 tenders for building, erected 1887-9 to designs by J. Vickers Edwards, County Surveyor. Early échelon plan. Hine considered it similar to Gloucester with improvements in the way of centralization and arrangement of corridors, and reproduced the plan in his RIBAJ article. Rapidly expanded to take 1,600 patients. Private asylum built by Dr S A Gill in 1886 to designs by William Parlsow. Plymouth Borough Lunatic Asylum, now sensitively converted to housing, some demolition.Competition held for design 1886 architects placed third given commission because they were the cheapest. Hine & Odgers, of Plymouth. Flat échelon plan, good example of this form in a smaller asylum. Mix of random rubble stone and some brick. Some attractive elements. Plan reproduced in Building News. 1888-1891 built, initially for 200 later 400 patients. 1901 same architects designed extensions, new wing male side commenced 1903 additional (second) storey on each side. Isolation hospital, and admin extended. 1924 permanent shelter for open air treatment at female infirmary (temporary one on male infirmary previous year, planned to replace with permanent one. Fourth Middlesex County Asylum, later 5th LCC Asylum Designed y G. T. Hine in 1888 built 1889-93, competition for the design held 1887. See post Repton Park, formerly Claybury Hospital. First large-scale complete échelon-plan asylum. Accommodated over 2,000 patients. Built on the estate of Claybury Hall, a late-eighteenth-century house, which was converted and extended for private patients. Typically the asylum was virtually self-sufficient, with its own farm, large kitchens, stores, and bakery, boiler house and three water towers. Recreation hall capable of seating 1,200, with oak panelled walls, and decorative plaster ceiling. Chapel linked to main complex by a corridor. By 1887 this was against the advice of the Commissioners in Lunacy who were encouraging the provision of detached chapels, able to hold about three-quarters of the inmates. The only differences from a traditional church should be the provision of separate entrances for male and female patients, and small rooms or lobbies near the door where a patient could be taken if they became disturbed during the service. G. T. Hine won competition for this in 1892, échelon plan, for 350 patients with extension to 500. Competition was judged by C. H. Howell. ‘His award after a somewhat stormy discussion was adopted’ [Building News, 26 Feb 1892, p.303] Hine and Odgers of Plymouth were placed second. Second World War EMS hospital. Interesting looking boiler house bit with reservoirs on either side. West Sussex County Asylum Designed by Sir Arthur Blomfield & Sons 1893 and built 1895-7. A good example of a county asylum built at the end of the 19th century on the échelon plan. article in Journal of Mental Science with ground plan. Report from 1893 by Blomfield. Built by B. S. Jacobs of Hull 1894. Transitional pavilion/échelon plan with semi-circular link corridor and pavilions off it as Cane Hill and Exeter. Built to ease over-crowding at the other Lancashire asylums. The Rectory Estate was purchased by the Asylums Board in 1894 on which to build new asylum for chronic cases, on lines of Caterham and Leavesden. Originally Old Hall occupied by 50 idiot boys. New asylum opened January 1902. 2,000 beds. Built to designs of Henry Crips & Oatley and W. S. Skinner (came third in competition). [Builder, 2 Oct 1897, p.272] Zig-zag version of Caterham/Leavesden – intriguing plan. Decided to invite plans for asylum in February 1893 with a competition to be judged by C. H. Howell. Wanted an asylum for 600 patients, capable of extension to 800. Foundation stone laid October 1895. Competition won by Gough & Trollope (or Giles, Gough & Trollope). First portion opened 1900 comprising admin wards for 600. Extended 1907-8. Échelon plan, listed tower, interesting looking little houses – ‘hospital villas’ patients or staff? Admission hospital, plans prepared by K. L. Murray 1931. 6th LCC Asylum Site chosen in 1893, plans had been drawn up by G. T. Hine by 1895, opened 1898 for 2,000. Échelon plan. This large mental hospital was built in 1896-8 to the designs of G. T. Hine. The plan was a modification of Hine’s échelon-plan at Claybury Asylum in Essex (now in the London Borough of Redbridge). It was the first asylum to be commissioned by the London County Council (LCC) and served as a model for three later asylums. When it was completed it provided accommodation for 2,000 patients who were mostly housed in the main complex. There were, however, a number of villas on the site for convalescents, new admissions and farm workers as well as the requisite isolation hospital. The mansion on the site was used as the residence for the Medical Superintendent. Hertfordshire County Asylum Designed in 1896 by G. T. Hine on the échelon plan. Opened in 1899 for 576 patients. Plan in Hine’s RIBAJ article. Vague memory of its being rather dull/plain. 7th LCC asylum Building work began in 1897, replica of Bexley, échelon plan. 8th LCC asylum First of five LCC asylums built at Epsom on the Horton Estate, temporary construction. William C. Clifford Smith, asylums engineer, drew up plans in 1897 opened 1899. At Middleton St George Seems to have been founded as Dinsdale Park Retreat or before that Dinsdale Spa Hotel – unless this elsewhere? Opened 1900 as a private asylum, built 1897-8 S. W. Dyson, Newcastle-on-Tyne. The hall became the superintendent’s residence. 1933 reconstructed. Proposed 1898. Local boy Hine is passed over here, designed by E. P. Hooley, the county surveyor, on an échelon plan. West Riding County Council decided to establish a separate asylum for paying patients c. 1898 (under terms of 1890 Act), estate acquired in 1895, new buildings were designed by J. V. Edwards, County Surveyor, Wakefield. Initially to be for 170 patients, removing 100 from existing three asylums in county. Intended to build ‘villa residences’ in park to bring total accomm to 350. Opened 1902. House was being sold off around 1993. Foundation stone was laid 3 August 1898. Accomm for 800 patients, designed by Lewis Angell, borough engineer. Échelon plan. Official opening 1 August 1901, copy of souvenir brochure, well illustrated and with plan from Essex Record Office. 1898 competition for design of asylum judged by Hine awarded to Martin & Chamberlain. Opened 1905. Vaguely échelon plan. Built between 1899 and 1903 by the Metropolitan Asylums Board as an infirmary for sick imbeciles. Later became a hospital exclusively for senile dements. Designed by A & C Harston on a pavilion plan similar to Leavesden and Caterham. 1915-25 extension of seven new ward blocks by Thomas W Aldwinckle. Plans c.1899. Visited other asylums before beginning including Hartwood, Lenzie, Gartloch and Hawkhead in Scotland, Cheddleton, Burntwood, Glamorgan, Dorchester, Isle of Wight and Chichester. Opened 1903, G. T. Hine, échelon plan with separate acute hospital (Park House) – influenced by Gartloch p’haps. Nice chapel, rest pretty utilitarian looking. Hine uses this one as his model in his RIBA paper. Designed for 1,115 with provision for extension to 1,275. Acute hospital for 80 patients near entrance to estate and at a distance from admin building. Main asylum 840 patients of all classes. Four detached villas with 30 patients each. A block for 60 idiot and imbecile children with rooms for 15 quiet female patients who assist in nursing the children. The David Lewis Manchester Epileptic Colony Built c.1900-4 to designs by Alexander Graham. David Lewis left the majority of his fortune to be used for the benefit of the working classes of Liverpool and Manchester. Group of people in Manchester had come together in the 1890s to establish a colony for the district for epileptics. Began fund-raising in 1897 and in 1898 sought assistance of David Lewis Trustees. Two deputations one to continent one to America in 1902, then drew up plans, although nearing completion by then – perhaps plans for management and running of the colony rather than design of the buildings. Admin, recreation hall, hospital, kitchen, school, laundry and workshops and farm, along centre of site with separate male and female accommodation on either side. Three homes each for men and women, school house with dormitories for boys and girls and cottages. 200 patients in all. Fourth West Riding County Lunatic Asylum Simple flat échelon plan. 1900 tenders being invited for ‘hospital and two cottages’ at Storthes Hall asylum, J. V. Edwards, County Surveyor. Admin, sick and infirm blocks, acute block, cottage homes, for 272 patients. 1906 tenders for second part of main institution. J. Vickers Edwards County Architect. Intended to construct asylum in three stages, first to comprise acute hospital and cottage homes (35 each for ‘workers’). [BN, 21 July 1900, p.61] First part completed 1904, on estate five miles south-east of Huddersfield. In 1904 plans under consideration for main institution for further 600 patients. 1907 tenders for erection of farm buildings and residence. LCC Epileptic Colony 1898 LCC decided to establish working colony for male epileptics. Originally going to erect temporary buildings but changed after Colney Hatch fire. William C. Clifford Smith drew up plans 1900, work completed 1903. Good, LCC Arts & Crafts style buildings making an attractive group. Middlesex County Asylum Particularly attractive complex, designed by Rowland Plumbe in 1900 on the échelon plan with separate acute hospital and detached villas for working patients. Opened in 1905 after the other Middlesex asylums had been transferred to the LCC. The chapel has been demolished. The hospital closed in the 1990s and has been converted to housing. Opening brochure in Hertford Library with lots of photos and line drawings. Copy in file. Canterbury Borough Lunatic Asylum, Stone House Asylum Erected in 1900-02 to designs by W. J. Jennings of Canterbury on a sort of mini-échelon, four two-storey pavilions only. Admin was demolished after Second World War bomb damage. Detached private patients block. Plan reproduced in Building News. Originally established as homes for inebriates. Designed c.1901 by Henry Littler of Preston, the County Architect. The Langho Epileptic Colony was opened in 1906. The scheme was inaugurated by the Chorlton and Manchester Guardians Joint Asylums Committee. ‘A new departure by the local Poor Law Authorities’ Designed by Giles, Gough & Trollope c.1902 for 272 patients, initially in 16 buildings, separate homes with forty beds each. Medical Superintendent’s house, mortuary, receiving and hospital block, assembly hall, admin, central kitchen, stores, workshops, power house, general laundry block. 6 homes arranged in groups of three to west and east of admin. Built by the Lancashire and Cheshire Society for the Permanent Care of the Feebleminded, to designs by W. G. Higginbottom. Opened in 1902. Second Worcester Lunatic Asylum G. T. Hine c. 1902 estate purchased 1899, built 1903-7, échelon plan with zig-zag bit at south end, for 254 males and 316 females, with view to extension to 1,200 total. Detached chapel quite nice. Isolation hospital nice but bashed about. 1937 admission hospital designed by A. V. Rowe, not built. Second World War EMS hutted hospital built, demolished 1992. City of York Asylum Built 1903-6 to designs by Alfred Creer on an échelon plan for 362 patients. EMS hospital added in Second World War. Photographed just before demolition in 1990, aerials just after. 10th LCC Asylum, Building began in 1903 re-used Hine’s plan for Horton, opened 1907. Échelon and a few detached villas. Closed 1992. 1904-7 Leicester and Rutland, designed by S. P. Pick of Everard, Son and Pick of Leicester. Pauper and private patients. Sort of flat échelon plan. Ills in BN 1907. Architect’s descriptive notes, well illustrated with photos. Closed March 1995, site sold to Alliance and Leicester. New Surrey County Asylum Built after Surrey lost Cane Hill and Springfield Asylums to the newly created LCC and to Middlesex. G. T. Hine, échelon and dog-leg plan, foundation stone laid October 1905, opened 1909. Part of Mary Dendy Hospital, formerly Sandlebridge Boarding Schools 19th century house, lodge, outbuildings and farmhouse bought 1906 and adapted for use by young mental deficient. Ashby Hospital built 1913. Laundry 1936.
designed by William Clifford Smith 1906-11, work began in 1912, but suspended during First World War and finally completed in 1921-4. Villa-system, supposedly based on American type, colonial style. More to it architecturally than Horton or Long Grove, though St Ebbas would probably come out tops. Which is the other one? Prize for the silliest name. Built in 1907 as a residential school for epileptic children by Manchester Education Committee. Comprises school, headmaster’s house and four villas grouped around a green. Monkton Hall was acquired c.1907 by the North Eastern Association for the care of the Feebleminded. 1921 re-opened as Calderstones Certified Institution for Mental Deficiency with 1,000 beds. 1908 opened. Established by the Guardians of Birmingham parish and Aston and King’s Norton Unions for epileptics and feebleminded. Monyhull Hall acquired, erected six homes, laundry, general kitchen and cottage for head attendant. Hall used for admin and staff accommodation. 216 inmates. Plans for a recreation hall to be added. Designed by C. Whitwell & Son of Birmingham. 1906 inviting tenders for foundations. 1910 foundation stone laid, designed by F. Whitmore, County Architect, and opened May 1913. Red brick, 22 blocks for 1,250 patients and residence for officials medical staff etc. échelon plan. ?1910 F. W. Troup. Parts built c.1927 to designs by J. H. Markham, HM Office of Works. In 1907 offer of £30,000 to LCC to establish hospital for treatment of mental illness, which would be for early treatment of cases of acute mental disorder with a view to preventing the need to send patients to a county asylum, also to promote research and to serve as an educational establishment for medical students. Originally thought it should be for 100 patients and that about a quarter would be private patients, and should be centrally situated. 1911 site in Denmark Hill chosen and new plans commissioned from Clifford Smith. 1915 buildings just completed, handed over to Military until 1920. Second Hampshire County Asylum Initially plans were drawn up for the asylum in 1899 by G. T. Hine, but project shelved until 1909. Plans approved 1912, for 1,300 pauper patients and 100 paying patients. Comprised main asylum for 810 patients, detached reception/admissions hospital for 100 patietns, four villas for 30 convalescent patients, private patients’ block (100) – possibly not completed until 1930. Two sanatoria for TB and dysentery (each with 45 beds). Isolation hospital with six beds. Medical Superintendent’s house and other staff housing. Before it was completed the finished buildings were taken over as No.4 Canadian Millitary Hospital. In 1921 it was transferred back to Hampshire County Council. Standard échelon plan of later type with covered ways and slightly greater degree of detachment of patients’ blocks – semi-villa style, but less than might have expected at this date, perhaps because of long gestation of plans. Three blocks, timber pre-fabs of c.1914. 1912 referred to proposed building for epileptics and imbeciles, Bradford Guardians. 1923 erecting padded room. 1931 minor additions. Aerial photographs from Health Authority, show a very attractive building. Great Barr Park Colony West Bromwich Guardians were concerned with overcrowded conditions of the mentally handicapped within their care. In 1909 Great Barr Hall came on the market and the Chairman of the Guardians suggested they acquire it. This they did in 1911. Walsall then joined West Bromwich. Initially accommodated children and mothers. Plans were drawn up in 1913 by Gerald McMichael to provide accommodation for 500 children, consumptives, mentally deficient imbeciles and epileptics. Each to be in small homes in three separate areas. The first two homes were not completed until 1921. In 1926 Sanders Home opened for children under five (demolished). 1924 same architect asked to draw up more plans for accommodation for low grade defectives. New work ranged around the original four villas in horse-shoe shape in use by 1929. 1930 estate taken over exclusively as a training colony for the mentally handicapped. The Hall became Prudhoe Hall Colony in 1914 established by the Northern Counties Joint Poor Law Committee for feebleminded. Buildings designed by J. H. Morton & J. G. Burell. Six two-storey villas, a hospital, staff houses, workshops, recreation hall, kitchens, laundry and boiler house. 1932 extension J. H. Morton & Son, two two-storey villas and one single-storey ward block, and further hospital, school staff housing new recreation hall (very nice) and kitchen. A good example of its type. Opened June 1917 for mentally deficient boys, claimed to be first establishment of its kind to be provided by a municipality since the Mental Deficiency Act of 1913 came into force. Established 1919-20 in Meanwood Hall by Leeds Corporation. Extensions were built in 1923, and in 1925 a competition for a colony on the site was decided upon, and won in 1928 by Shepperd and H. Carter Pegg. The colony buildings were erected between 1932 and 1941. Photographs of Meanwood Hall in red boxes. Hospital covered in The Builder, also an opening brochure. RCHME photographed the brick villas. Opened by Hull Corporation in 1921 for 50 female mental deficient. Ward block added 1928-9, and two villas built in the 1930s. Laundry added later. The house was taken over by West Riding County Council in 1925 for the accommodation of mental deficient. Opened 1926. Two single-storey building erected c.1930. A Spider-block of EMS hutted wards was added during Second World War, c.1942. The house was boarded up in the early 1990s. House seems to have been acquired by Nottingham Corporation for Mental Deficients by 1926. Four villas, stores and a recreation hall were built to the south of the house. Built in 1926-30 to designs by Charles Ernest Elcock to replace the hospital at St George’s Fields in Lambeth. On the colony plan, and unusually with some Moderne touches, enhanced by white-painted render, amidst the Neo-Georgian generally insisted upon by the Board of Control. Illustrated in The Builder 1930. Chapel particularly good. Elcock also designed Runwell which repeats many of the elements here. Established by South West Yorkshire Joint Board for Mental Defectives. 1928 acquired estate of St Catherin’s at Loversall to west of town. Vincent Turner, architect, of Rotherham, drew up plans in 1930 for a colony for 640 inmates. Not all built, carried out in three stages. House became admin, villas for males (2), females (3), children (2), low grade (2), plus workshops, recreation hall, school, farm buildings and staff houses. Coleshill Hall was acquired by Birmingham Corporation by 1928 when advertising tenders for four villas and alts and adds to residence. H. H. Humphries, City Engineer. Weston House was acquired about 1928 by Warwickshire Rural District Council as a colony for mental defectives. Patients’ villas were built in grounds, three on same plan, two storey U-plan, and a single sotrey one, plus assembly hall. Typical small colony. Mental Deficiency Colony. Coldeast House, an early nineteenth century house once owned, at different times, by Admiral Lord Hood, Quintin Hogg and the Montefiore family, was purchased by Hampshire County Council in 1925. Intended as a colony for 1,000 inmates. The house was adapted and opened in July 1928. County Architect, A. L. Roberts. 1931 first villa completed, nine more built between then and 1938, of one and two storeys. Also a school, assembly hall and mortuary. Sanatorium c.1949. Plans in Hampshire Record Office. Site plan of 1927. Founded by St Luke’s Charity which ran asylums in London until 1916-17. Built 1928-30 with proceeds from the sale of its Old Street premises, the charity adapted three villas in Woodside Avenue as a 50-bed hospital for nervous disorders. Enlarged to provide 100 beds to qualify as a teaching hospital in 1948. Little Plumstead Mental Deficiency Colony stablished in grounds of Plumstead Hall. 1928-32 G. S. Smith, County Surveyor, altered lodge, house and stables and drew up plans for new buildings including four villas, kitchen stores, laundry, water tower, medical superintendent’s house and school, designed but not all built. Standard and plain one-to-two storey buildings, similar to Harperbury etc. Norfolk Record Office has good photographs and plans. House acquired by East Riding and York Joint Board for Mental Defectives 1929. 1931 adapted hall for 181 inmates and one male pavilion was planned which opened in 1932, c.1936 three villas erected. Typical plain buildings. Middlesex Colony for Mental Defectives Work began in 1929 and continued until 1936 to designs by the County Architect W. T. Curtis. Provided accommodation for 1,154 inmates. Covered in The Builder when it opened. Another typical example of this type. Mental Deficiency Institution. Tenders accepted in 1929. Formerly seems to have been Leicester Frith Home of Rest, possibly a private house, c.1870. Appears on 1928 map as Leicester Frith Institution for female defectives. Wing added to west. 1930s buildings. Good aerials, house looks nice but mental deficiency villas as dull as ditchwater. Designed by John Stuart, Essex County Architect 1929. First section opened in 1938. Plans in Essex Record Office 1929 and 1934. Covered in The Builder. Not visited. Middlesex County Hospital and Colony, Designed in 1930 by W. T. Curtis, County Architect, for 2,000 patients. Built in two phases, first completed 1934, second underway by 1937. Block plan and perspective from The Builder. Attractive site. House acquired by Cumberland, Westmoreland and Carlisle Joint Board 1930-1 house altered and two villas built to designs by J. H. Morton & Sons, further villas added later, plus recreation hall and school. Mental Deficiency Colony established by 1931 by Hampshire Joint Hospitals Committee. Three villas and temporary hospital built 1939, J. M. Sheppard. By 1941 additional single storey buildings. Standard stuff, brick, hip roofs, windows close under eaves, very plain and utilitarian. By early 1990s stables of house and house itself boarded up. Established by Hull Corporation between 1936 and 1939 for male mental defectives. 1932 bought estate. 1933 City Archtiect, D. Harvey, designed two villas, admin, school and recreation buildings, ended up with four 40-bed pavilions. Opened 1939. The Hall and estate were acquired by Cheshire County Council in 1932. The Hall became the admin offices. 1932-8 seven standard villas, mostly of two storeys, school and workshops added. Photographed by RCHME. A nineteenth-century house in large grounds, with four two-storey villas near by, two on each side of the house, of standard type for a mental deficiency colony. Previously this had been a sanatorium: Maitland Cottage Sanatorium, founded around the turn of the nineteenth to the twentieth century for six patients. This had been increased to seventy by 1913 and it became an annex of Kingswood Sanatorium for working class patients. Seems to have become the Berks and Bucks Joint Sanatorium before being taken over by the Buckinghamshire, Oxfordshire and Reading Joint Board as a mental deficiency institution in the 30s. A scheme for a colony was proposed by the Board in 1930, approved in 1931 and tenders invited in 1932. W. K. Howell, architect. Closed by the early 1990s. Designed in 1933 by Elcock & Sutcliffe. It attempted to embody the ideals of the 1930 Mental Treatment Act, and the plans were drawn up in close collaboration with the Board of Control. There was a new emphasis on remedial treatment of mental disorders. Elcock visited mental hospital in Britain, on the Continent and in the United States. The foundation stone was laid 20 June 1934, brochure in my drawer in the office. Designed for 1,032 patients in villas or pavilions of one or two storeys. Perhaps the last hurrah of mental hospital design in England, indeed it was the last big municipal psychiatric hospital, and one of the few built after the First World War as most of the new institutions were for the so-called mentally deficient. Barrow Hospital. Designed by Sir George Oatley, architect. Plans approved 1934, the first patients admitted in 1938 and the hospital officially opened in 1939, though never completed due to the outbreak of the Second World War and so of the proposed 1,150 beds it only accommodated 375 patients. [Sarah Whittingham, Sir George Oatley: Architect of Bristol 2011] It was designed on a colony plan, and like Runwell was a mental hospital, not a mental deficiency colony. During the War it became a Royal Navy Auxiliary Hospital. Stoke Park Colony Interwar colony, c.1935 – The Incorporation of National Institutions for Persons Requiring Care and Control. Kent County Council, W. H. Robinson architect. Tenders for buildings 1935, hospital block, two pavilions, workshops recreation hall. Proposed, but never built. A competition was held for the design in 1936-7 judged by Elcock, Kirkland and Abercrombie, won by J. M. Sheppard & Partners. [photo of the architects in The Builder, 14 May 1937 p.1041] It was to be built on a 600-acre, wooded site, part of Lathom park estate near Ormskirk. The hospital was to comprise a mental hospital for 1,000 patients and an institution for 2,000 mental defectives. The conditions of the competition suggested south of site for the hospital, and buildings had to conform with the suggestions and instructions relating to mental hospitals published in 1933. Accommodation required for the mental hospital included an admissions hospital, convalescent villas, four villas for special cases, a sick hospital, villas for working patients, closed united for excited cases, single storey wards, epileptic wards and ‘undefined’ wards. Also admin block, recreation hall, workrooms, three large shops, sports ground, general stores, canteen, nurse’ home, Medical Officers residences, and accommodation for clerk, steward, and engineers, and a church. For the mental deficiency colony villas for adults, 50-60 in each, classified as epileptics, troublesome, and low grade, also for children, homes with 50 and 40, also termed low grade, and a hospital. Established by Durham County Council c.1936 intended for 300 patients. Rees & Holt architects, six two-storey and two single storey villas, workshops, service buildings, and school. Admin after 1948. Opened by Northumberland County Council in 1938 as a mental deficiency colony for 300 patients. Original buildings included admin, five villas, dining hall, recreation hall, staff houses and service buildings. Standard fare. Established c.1940 for the mentally subnormal. A private house of c.1806 rebuilt by Josias Cocksutt a Yorkshire ironmaster. Wyatt possibly involved somewhere. After the Second World War it became a home for mentally defective women, c.1945. Where can I find more information about St. Mary’s Hospital, Stannington, Morpeth? I had a family member who was there in the 1950’s. Records for St Mary’s Hospital are with Tyne and Wear Archives. Although patient records after 1948 are not listed on the Hospitals Records Database (you can access this via the National Archives using ‘Discovery’), there is a note of unlisted material deposited after 1986. Your main difficulty will be that most records relating to people are subject to a 100-year closure period. I suggest you contact Tyne and Wear Archive services (details below), they may be able to do the research for you, but there will be a fee. If they don’t have the patient records for that period, they probably know what has happened to them. Hi, you put a floor plan and key of the Middlesex county lunatic asylum colney hatch, and I just wondered if you knew what the words say to the right of the picture, as they are blurry on my screen, and I am really interested to know what it says as I have been trying to find out what the letters mean for the different wards, my great nan was in an asylum, and on her notes it uses letters instead of ward names. The web address above should take you to the Wellcome Library, if you then click on the ‘view online’ this takes you to the best version of the plan – clearer than downloading the high res image from the Wellcome Images page. I hope that helps! Which asylum was you Nan a patient in? Thank you Ana, it is always good to find out how people use the site. You make a good point, and I will give it some thought. The list began with asylums built as public institutions, so there are quite a few private asylums that are missing. The more important of the private asylums certainly should be included, and I will add Peckham to the list.